Home » Resources » Are You Rumble Strip Ready? Rumble strips are generally the last item of work on a project, and SPT can cut over 20 miles of asphalt in a single eight-hour shift. This production speed catches many contractors by surprise. Schedule rumble strips when your project is in its final phase. While most projects stipulate that all work must be completed in project phases, every state DOT office has granted exceptions for shoulder rumble strips. Most DOT’s will allow rumble strips to be completed under a single mobilization in the final phase, which avoids multiple mobilization charges and having rumble strip operations interfere with other work. Paving and striping 100% complete. 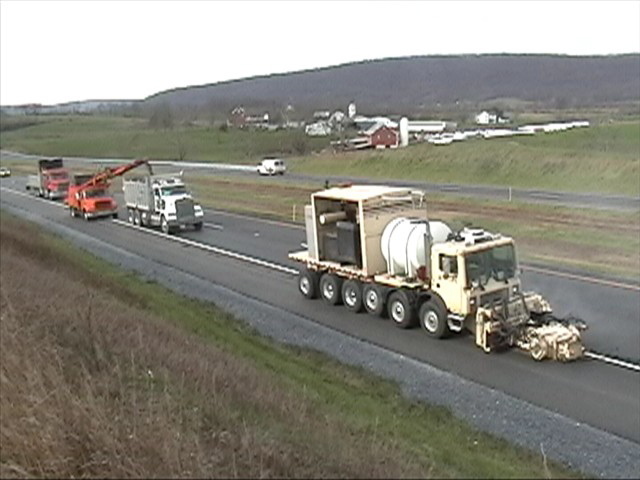 Scheduling paving or striping simultaneously with the rumble strip operation usually interferes with someone’s work. Multiple mobilizations increase costs to the general contractor. SPT requires either a temporary or permanent edgeline in place to begin construction. If we use asphalt joints, edge of pavement, intermittent dots, or other references you increase the risk that the rumble strips will not match final lines as required. The general contractor handles sweeping on most projects. If you plan to sweep the debris over the shoulder’s edge, you will need two brooms for shoulders over 6-feet wide, and one broom for shoulders less than 6-feet. If the state requires you to pick up the milling debris, two mechanical brooms and two dump trucks are needed to keep up with milling operations. Vacuum brooms do not work well picking up heavy millings at a three-mile per hour rate. On many projects SPT’s crews are equipped to handle the cleanup and this is usually bid as an option if available. SPT will cut at a pace roughly 3 miles per hour on asphalt. The general contractor should supply traffic control to maintain that speed of operation. A moving operation lane closure works the best. SPT will need 500 gallons of water once a day on the job site. We cannot take water directly from a lake or stream.